You all know, Frak and I are big admirers of Costanza Macras and her theater company Dorkypark. Also, I am big fan of theater and dance outside the setting of a stage. Outside Berlin, inside a dark teutonic forest called Müggelwald our Argentinean choreographer is doing a unique show for Schaubühne. The performance of Forest: The Nature of Crisis asks if during an era of crisis, there can be a return to nature and explores the associated desires and the significance of the regional in times of a global economic crisis. Macras will be working on cultural patterns attached to the forest and relates them to its myths, fairy tales and images. A piece of Berlin forest is turned into a contemporary artificial landscape where we will encounter environmentalists, forest campaigners, economists and freaks. I am really looking forward to it and I hope you do, too. More pictures and information after the jump. Can you imagine a neighborhood in Berlin with only one ethnic background? This is the case of Chatsworth, a part of Durban in South Africa. During Apartheid all the inhabitants with Indian roots had to move to one common neighborhood. There they got only small houses to live in. Through this measures, the government hoped that the community of Indians would not grow larger. Enfant terrible of the dance theater scene – Constanza Macras – choose Chatsworth as the title and frame of her newest piece. Her particular style of documentary dance theater takes the audience through fragments of unique stories, local music, romantic songs and her signature group dance scenes. “We make things that break easy. We people don’t!” – That is the outspoken subtitle of the new documentary/theater/dance piece The Ghosts by Costanza Macras at Schaubühne. Featuring underaged but incredibly talented acrobats from China telling the story of their lives in between acts of artistic braveness this piece has a quite unusual but nevertheless engaging and interesting topic. For Macras the Chinese acrobatic artists, who once were celebrated for their bravery now live in materially precarious, ghostly conditions. This manifests a metaphor for life in contemporary China, with its contradictions, social injustice and power structures. Those who once brought the country glory and honor are discarded as soon as they are no longer top achievers. Instead of taking the audience by storm with a strong and unstoppable ensemble as in Macras’ previous pieces, The Ghosts comes to life through the three Chinese girls who were the heart of the piece. Also, the dynamic with the audience (and maybe also an unplanned manipulation) was quite special in my opinion. The young girls presented the circus acts they usually show to the visitors of an old amusement park on a little Chinese island. The audience bamboozled and often even clapped between the acts as if they where in a circus instead of a theater. I think most of the (intellectual) audience in this kind of theater would rather disapprove to watch underaged children perform dangerous acts for their amusement. But out of the context and hidden as “documentary theater” I guess that some people actually quite liked the adrenaline pumping acrobatic talent of the performers. This showed to me how easy it is to make people like something, they would normally disapprove of. And this little mind-trick was for me actually the best thing of the whole piece. Tonight you have still the chance to see the amazing piece at Schaubühne. Check out photographic impressions of The Ghosts after the jump. There are some theater and dance companies that make me wish to have pursuit other career options. Since I am way too old to become a dancer I have to limit myself to watching their incredible perfomance and perhaps review them. One special company which is such a pain to watch because they are so incredibly good that you wish you could be on stage with them is the Costanza Macras ensemble Dorky Park. If you never heard of them and wish to experience my unbareable craving to be involved, they are playing again their great piece Megalopolis this weekend at Schaubühne. More photos, a trailer, a summary and details after the jump. Retrospectives are usually more of a common thing for older, established artists and do not fit the usual style of the fast changing league of Berlin’s avant-garde. But it seems that looking back has become the new fast forward in this town. In the case of the dancing duo Jared Gradinger and Angela Schubot we really don’t mind to see a retrospective of all their work they have done so far at the HAU Theater. Gradinger has also created the little fluffy Pictoplasma monsters we love so much and gathered some international reputation working with Costanza Macras in the past. I prefer there earlier pieces like Is Maybe to the latest, but make up your mind for yourself. Check out the Facebook event for all the details. More hot dancing pictures after the jump. There are some theater and dance companies that make me wish to have pursuit other career options. Since I am way too old to become a dancer I have to limit myself to watching their incredible perfomance and perhaps review them. One special company which is such a pain to watch because they are so incredibly good that you wish you could be on stage with them is the Costanza Macras ensemble Dorky Park. If you never heard of them and wish to experience my unbareable craving to be involved, they are playing their new piece Megalopolis this weekend at Schaubühne. More pictures, a trailer, a summary and details after the jump. Constanza Macras is doing theater in the forrest, Prinzip Gonzo is playing a theatrical Game of Life in an abandoned industrial hall and KiezOper is bringing their piece into the Wilde Renate night club. And these are only a few of the examples where theater in Berlin bends the rules and brings their concepts outside of the actual theater houses into the urban wildlife of the city to create new, interdisciplinary experiences. With the piece Berlin Bound the Thin Skin Theater and Sisyphos, der Flugelefant have created yet another off-stage theater experience. They collaborated with the night clubs Griesmühle and Brunnen70 to stage what they describe as a party performance. Previously performed at Kater Holzig in 2012 it has already earned some praise and therefore was reactivated for new shows in 2014 in new night clubs. 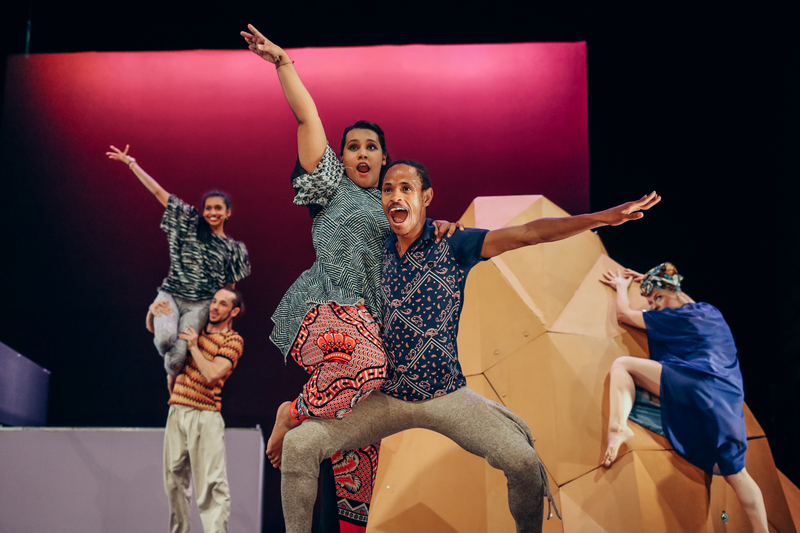 The performance is a colorful and crazy recreation of a plane trip to a place called home and the guests are invited to come along. What does it truly feel like to be home? What’s required for one to feel at home? Is it possible to preserve one’s identity or must one leave it behind? In Berlin, many people share the experience of leaving one’s own cultural system behind in a search for something new, ultimately to establish oneself as a member of a foreign culture and society. The arrival lies in your own hands. The double premiere of the performance will happen this weekend with additional shows the weekend after. More details and a trailer after the jump.